(10th) Emirates Stadium, North London - Keith was in the sell-out 60,000-plus crowd to watch his beloved Arsenal beat Everton 2-0 (sorry Anne Marie). A fine (Vantastic) goal from Robin Van Persie sealed the victory. It was a historic day for the club. Saturday, December 10, 2011 marked the 125th anniversary of Arsenal Football Club. (25th) Christmas Day - with this year being a somewhat traumatic one for both Keith and his family, let's just say he spent this great day in a very, very different, but most fulfilling way. "Safe to say, I will never see Christmas Day in the same way again," Keith recalled. (18th) The countdown to the US release of Keith's Marilyn book begins when his American publisher, Thomas Dunne announces the publication date of it. Retitled, Marilyn Monroe: The Final Years, it will be issued in the States on July 17, 2012, to mark the fiftieth anniversary of her tragic death. As listed on Amazon.com, "This definitive account dispels the rumors and sets the record straight on her last two years. Keith Badman delves into the reality of Monroe's last days in this surprising, and painstakingly researched biography. Dispelling some of the most pervasive beliefs as well as bringing light to others." (25th) From strength to strength - Amazon.co.uk run out of copies of The Final Years Of Marilyn Monroe. After waiting ten days for a new delivery, the online giant, in an indirect way, admits that, for the time being, no further copies are expected. (29th) Amazon.co.uk - With Keith's Monroe book now becoming a rarity, a dealer in Florida seized the opportunity and began advertising copies of the publication; his price, a whopping £82.87 (plus postage & packing). While, in the UK, another dealer on the site was offering it for a slightly lower price of £79.95 (plus p&p)! Meanwhile, over in the States, on Amazon.com., one enterprising trader in Washington began advertising copies of the book for... wait for it, a mouth-watering $252.31 (plus handling). Daren't look on eBay! (30th) Amazon.com - The prices being offered for Keith's publication continue to escalate. Another dealer on the website begins offering the tome for $472.97! Yes, you read it right. (3rd) With the premiere of the new George Harrison Martin Scorcese documentary taking place the previous evening in both London and Liverpool, Keith was invited to talk about the movie on BBC Radio's Sony Award-winning, Andrew Peach Show. (7th) University of the Arts, London - At 1pm this afternoon, Keith was most excited to enter one of the Holy Grails of the film industry; the archives of the late, great movie director, Stanley Kubrick. In a four-session session he enthusiastically trawled through paperwork relating to his 1968 space epic, 2001: A Space Odyssey, by far the greatest film ever made. Keith would like to thank Monica and Richard at the centre for their wonderful assistance that afternoon. (12th) There are exciting times ahead, in both here and America, for Keith's book, The Final Years of Marilyn Monroe. More news soon. Record Collector articles update. Over the past few months, Keith's regular monthly column, Rockin' The Box has featured Madness (in the June 2011 issue), Terry Jones & Michael Palin from the Pythons (August), the late-great, Flick Colby of Pan's People (September), The Sweet (October) and a recently recovered, 1975 interview with the late Glam-Rock superstar, Marc Bolan (in the November issue). (26) A further BBC interview for Smile; this time for the Steve Ladner morning show on BBC Radio Kent. (29) Former DJ and Top of the Pops presenter, Jimmy Savile, died two days short of his 85th birthday. Keith met him on Friday, April 29, 2010 at the V & A Museum's Harry Goodwin / Top of the Pops pictures exhibition and book. "I always wanted to ask him two questions," he said, "and that night I did and he answered them"
(13th) Spice of Life, London - Keith was in attendance at the launch of the new Chords DVD. Directed by friend, Michael Chapman, the official-approved documentary of the 1970s British pop group is set for release on Monday, October 17. (15th) Thanks to Keith's long-time friend, chum and confidante, Danny Wall for the invite to the open-air Jazz Festival at Imperial Wharf. A splendid time was had by one and all. (22nd) Work on Keith's latest project with the Rock Gods, Queen wrapped this day. Watch this â€˜Hot Space for more news on it soon. (9th) With another John Lennon-related auction taking place in Berkshire today, Keith was requested to talk about the sale on BBC Radio's Anne Diamond Show this morning. (28th) For more years than he cares to mention, Keith, has been presenting the video show at the annual Beatles Convention in Liverpool and, in light of his recent family troubles, this year was his best ever. He would like thank (in no particular order), Victoria, Ian, Billy, Dave, Ray, Steve, Charles, Wendy, Trish, Steve, Anne-Marie, Neville, Michael, Pete, Mel, Cavern City Tours and the hundreds of others for making him feel so welcome and loved. Thank you all! The video presentation, which was transferred to a new room, was a tremendous success. At 9:40pm, in Keith's words, "There wasn't a spare seat in the house and fans were queuing at the door to get in." 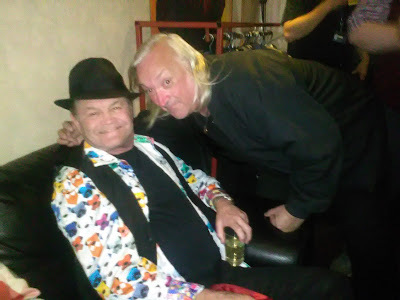 Prior to the start of the show, and the Convention itself, Keith found time to (finally) give an interview to Pete Dicks for his highly popular, WCR fm Wolverhampton-based, radio show,Beatles and Beyond. (4th) Another one for the "You couldn't make it up" file; at approximately 5:40 this afternoon, on his way back from Ascot in Berkshire, the vehicle in which Keith was travelling, found itself trailingâ€¦the MONKEEMOBILE! Yes, the world-famous car, which once belonged to televisionâ€™s greatest-ever manufactured group, The Monkees. (Keith's long-time adoration for the band goes way, way back! ) Despite protestations to the driver to "Follow that car," the vehicle soon disappeared from site, sadly. One for the "It slipped through the net" department. Keith's brief interview for CNN about Marilyn Monroe and her enduring appeal was posted recently. The piece, written by Laura Allsop is entitled"Why Gentlemen Still Prefer Marilyn Monroe"
(29th) Queen's official documentary, now titled "Days of Our Lives", received its television premiere on BBC2 this evening at 10pm. (Part 2 was screened the following evening at the same time.) Congratulations must go to the producers, Simon Lupton and Rhys Thomas and director, Mathew O'Casey for their splendid work on the show. So, what exactly has Keith been doing since the release of his (No.1) Marilyn book last September and why has his website hardly been updated? Well, we can reveal that he has been carrying out, intermittently, archive research on the new, officially approved, documentary on the legendary rock group, Queen. Entitled A Certain Band Called Queen; it is provisionally scheduled for a television premiere on BBC2 shortly. More news soon. Watch this (hot) space! Meanwhile, worldwide, foreign-language versions of the book have also been sold, to America, China, Italy and Brazil.